Being a privy/outhouse digger I have become fascinated with sanitation in the 19th century. "Or lack of "is a better way of putting it. It is amazing how far we have come since the days of the outhouse and "lack of sanitation" in the city' s and towns around the world.Granted,a lot of city's of today are not the cleanest, but compared to 19th century standards, they are like the yellow brick road in the land of Oz. Going back 100, 160 years, American cities were smelly and disgusting ? 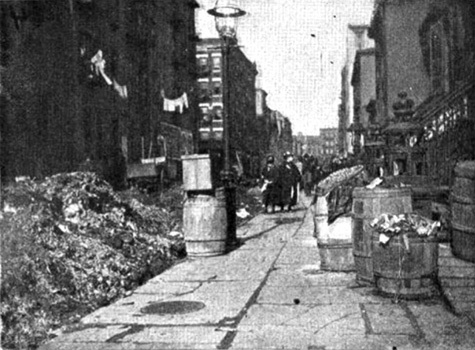 New York City was notorious as the filthiest and stinkiest city around. The rumor goes that sailors could smell the city 10 miles out to sea. And all of this filth exacerbated a public health crisis ? people were dying of diseases like typhus, cholera, yellow fever, it spread more easily in neighborhoods where the streets were dirtier. A cholera epidemic in the 1830?s killed 3,517 people, which was roughly 12 percent of the population at the time. That same percentage would mean about 100,000 people today. The mortality rate in 1860 New York was equal to that of medieval London. There wasn't any known cure for of these diseases back then,only time would tell if you were going to live or die. Only the strong survived. I guess you could say it was "survival of the fittest" . For thousands and thousands of people, there were no toilets, no clean water. All household rubbish from these overcrowded dwellings, including excrement, was dumped in the street and flowed through an open sewer drain. what a way to live! The thing that we forget is, that is the only way they knew, So they were just living life. A stinky life but a life. These living conditions meant that disease was common and people did not live long. At this time the citizens of most big city's died at an average age of just 27,and that was pushing it. It is no surprise that, in July 1832, there was a cholera epidemic. Cholera thrives when water is polluted by sewage. The standards of sanitation were so low - virtually streams of raw sewage ran through the streets - that many people, forced to live in these appallingly unhygienic conditions, were bound to catch the deadly disease sooner or latter. Records show that 1,347 people caught the disease and 402 died. Most of these victims were buried in mass graves. The symptoms of cholera are like those of food poisoning: dreadful stomach pains, terrible vomiting, severe diarrhea. Without proper medical care it is frequently fatal. The victim can die of dehydration within just two days of the first symptoms appearing. I was a very unpleasant death. This epidemic lasted for six months from July until December 1832, but cases of cholera were common during the rest of the century. Cholera, as well as other diseases such as typhoid, is mainly spread by infected water. Towards the end of the century, the provision of pure water for the cities began to bring about a dramatic improvement in public health. At the time they hadn't a clue that the water was causing all of the carnage. Thousands of Nottingham poorest inhabitants lived in narrow streets, alleys and courts, lacking street paving, street lighting, adequate water supply or is a graphic description of the situation in 1845. Toilets (called 'privies' or 'Pail closets') were usually common to the whole court or street, and located outside. 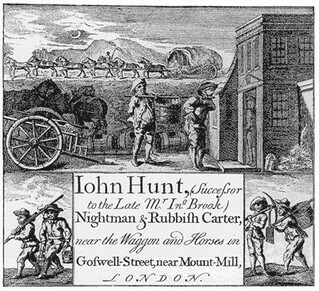 The waste was not flushed away; instead it fell into a pail, pit or container underneath the privy It remained there until it was collected by men known in Nottingham as 'muck majors'. 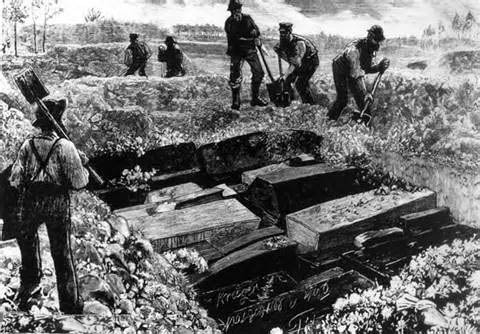 In other places they were known as 'night soil men', because the collection was usually done at night. It was then sold to farmers as a fertilizer. Most people also used a communal tap or pump to collect water for their household. The role of contaminated water in spreading cholera was not understood until 1854. 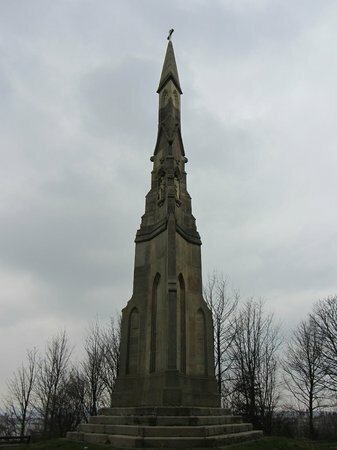 Nottingham's relatively sophisticated water supply system, inaugurated by Thomas Hawksley in 1832, was regarded as one reason why the cholera outbreak in 1848-49 was not as severe as that in 1832. Real improvements in sanitation began in Nottingham after 1845. The water supply companies were amalgamated into one organization, the Nottingham Waterworks Company. The Inclosure Act of 1845 contained regulations concerning 'nuisances' and the quality of newly built houses, including a clause relating to the distance that there should be between privies and living accommodation A Sanitary Committee for the Borough of Nottingham was established in 1847, and made regular visits.However, the first Borough Medical Officer of Health, Edward Seaton, was only appointed in 1873. His first report showed that there were still problems of sewerage which needed to be tackled in particular parts of the town. Some of the insanitary conditions mentioned in reports in the mid-19th century were still evident in the early 20th century. It shows privies and communal taps still remained in the slum areas. The Privy Reaper. Death was around every corner. A typical back yard in the 19th century. The Apostles of Filth & cleanliness. The 19th-century Sanitary Movement denied the germ theory of disease, yet created our public health infrastructure. Most residents of the United States take public sanitation for granted. They expect their drinking water to be free of disease-causing microorganisms and their streets to be clean. Yet it was not always so. 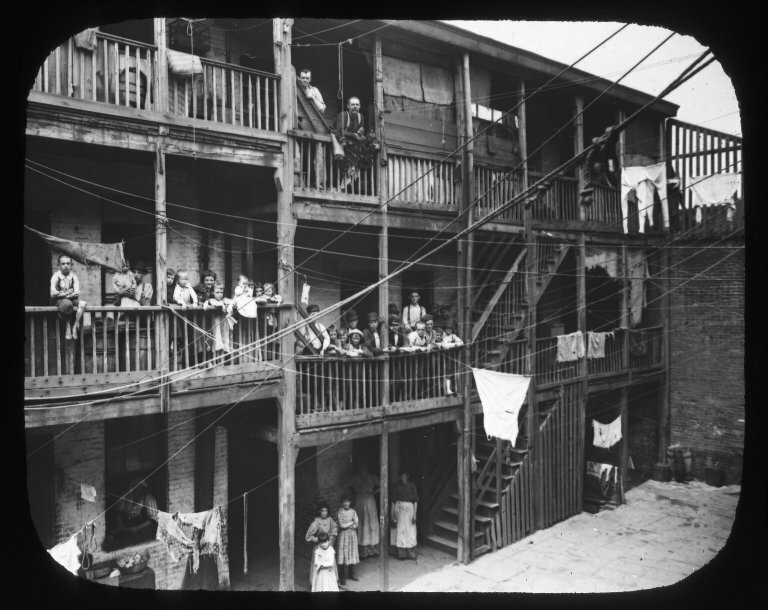 Until the early 20th century, the living conditions in many, if not most, U.S. cities were far from healthy. An organized effort to safeguard public health was essentially nonexistent. Public health became a civic problem as urban population density increased. While the urban population was never high in early America, the Industrial Revolution and increased immigration caused a population boom in American cities. From 1840 to 1920, the U.S. urban population grew from about 1.8 million to more than 54 million. This influx of new city dwellers increased human and industrial waste, and strained the minimal resources used to deal with refuse. Contagious diseases swept through urban areas. In the early 19th century, the reigning explanation for the spread of disease was the miasmic, or anticontagionist, theory. This theory held that disease was caused by sewer gas, garbage fumes, and poor sanitation. While we now know this to be false, the earliest bacteriological research, which led to the germ theory of disease (also called contagionism at the time), did not have an impact on American sanitary practices until the late 19th century. The anticontagionist theory gave impetus to the Great Sanitary Awakening, the rise of organized public movements to improve sanitation in urban Europe and the United States. The Sanitary Awakening began in England during the last quarter of the 18th century, spurred by John Howard?s reports on the poor condition of prisons and hospitals. The greatest British sanitary reformer was Edwin Chadwick, whose research was influential in securing the passage of the Public Health Act of 1848. Chadwick published the now classic General Report on the Sanitary Conditions of the Labouring Population of Great Britain, and he was behind the movement to establish the first British Board of Health. His views were antithetical to those of the contagionists, especially his contemporary, John Snow (see box, ?Snow and water?). Chadwick?s example inspired reformers in the United States. In April 1850, Lemuel Shattuck, a teacher and amateur genealogist, wrote the first comprehensive plan for an integrated state program of public health in the United States. His report dealt with the construction of buildings, waste disposal, the pollution of streams and the atmosphere, the control of communicable diseases, and other aspects of the hitherto neglected field of preventive medicine. Like his British predecessors, Shattuck believed in the miasma theory of disease. He had no knowledge of bacteriology and no formal training in the sciences. Yet of the 50 recommendations in his 1850 report, more than 36 were universally accepted public health practices 100 years later. Scientific proponents of bacteriology dismissed the theories of Shattuck and other anticontagionist sanitarians, but the Sanitary Movement had a prodigious impact on public health in the United States. 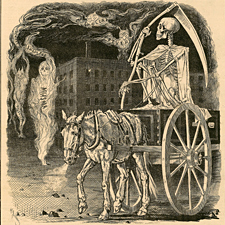 Mid-19th century sanitarians in New York City expended much energy promoting the passage of a metropolitan health bill that would address miserable living conditions there. At this time, New York had a higher mortality rate than most cities in the United States and Western Europe. Members of the New York Sanitary Association were convinced that the diseases that contributed to this high rate were primarily due to the absence of proper sanitary practices and could be prevented. Sanitarians wanted to improve public health law and educate the populace about proper hygiene. 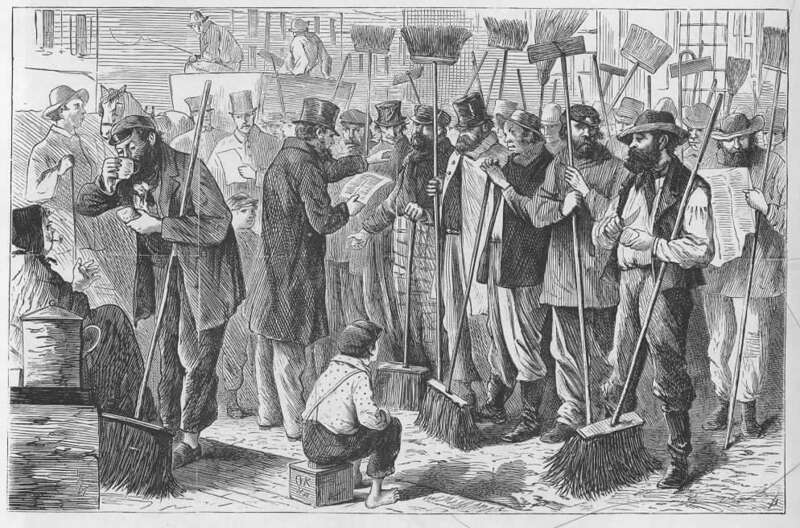 Street sweepers also known as "Chiffoniers"
In 1864, the New York physician Stephen Smith organized and directed a sanitary survey of New York City, a landmark event in the history of American public health. Many students of public health still consider this survey to be among the most comprehensive ever made. It contains vivid descriptions of living conditions unimaginable to contemporary Americans. 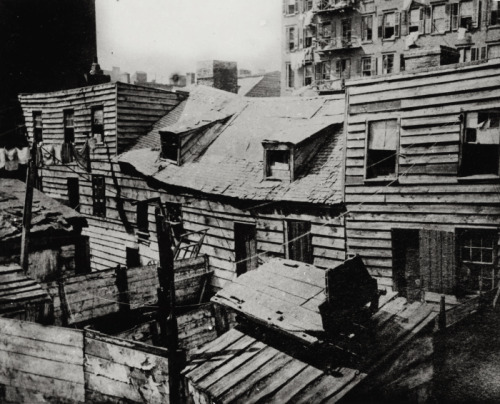 The inspectors wrote about overflowing privies, slime-covered streets filled with horse manure, and slaughterhouses and fat-boiling establishments dispersed among overcrowded tenements. One inspector reported that blood and liquid animal remains flowed for two blocks down 39th Street from a slaughterhouse to the river. It was common knowledge that youngsters could earn nickels by standing along Broadway and sweeping a path through the muck for those who wanted to cross the wretched boulevard. The New York survey was responsible for immediate improvements. Smith testified before the New York Senate and Assembly, and just over a year later New York passed the first comprehensive health legislation in the nation. The newly established Metropolitan Board of Health was the first government agency dedicated to truly professional sanitary reform in the United States, and New York?s sanitary legislation served as a model for other local and state bills. Smith?s work in New York City also led to the formation of the American Public Health Association, on whose board he served. 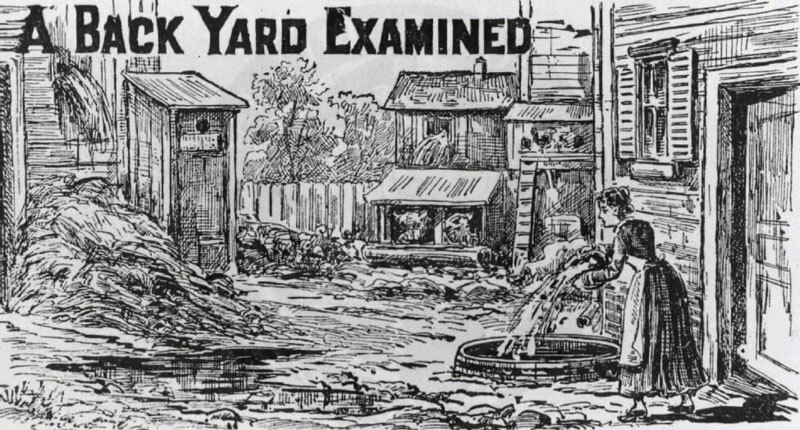 While the mortality rates in New York were higher, the city of Chicago was not free of sanitation crises in the 19th century. In the 1850s, Chicago endured a succession of cholera and dysentery epidemics, incited primarily by the city?s random waste disposal methods. In response, the Illinois legislature appointed Boston city engineer Ellis Sylvester Chesbrough to be chief engineer of the Chicago Board of Sewage Commissioners. Chesbrough immediately submitted a plan for a sewage system designed to solve Chicago?s waste disposal problems. At that time, not one U.S. city had a comprehensive sewage system, although most had sewers. In devising a system that would best serve Chicago, Chesbrough visited several major European cities and studied their sewage systems. The most important 19th-century sanitarian was also an anticontagionist, Colonel George E. Waring. 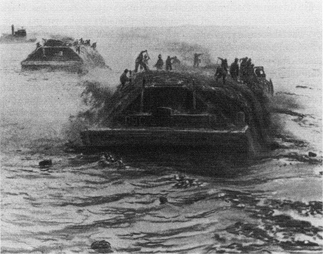 A farmer, agricultural and drainage engineer, and cavalry officer in the Union army, Waring helped to establish sanitary engineering as a profession. After the Civil War, Waring developed a reputation as an expert on scientific agriculture. He published popular books and articles on sanitation (such as Draining for Profit and Draining for Health) and even acquired a financial interest in a British-designed earth closet (a toilet that was similar to a soil-composting system). Indeed, Waring initially criticized water closets (standard flush toilets) as threats to public health because they exuded the ?sewer gas? thought to be a primary cause of disease. But after earth closets failed to sell in America, the colonel switched his position and advocated the universal adoption of the water closet! In the 1870s, Waring expanded his advocacy of the water closet to a broad-based crusade against sewer gas and the diseases it was thought to cause. Throughout the late 19th century, Waring?s views on disease were endorsed by much of the medical profession and by most of the general public. He traced disease outbreaks to putrid house drains and stagnant ditches. The remedy to such disease-producing miasma, Waring argued, was the installation of proper sanitary fixtures, which would remove the sources of ?bad air?. The complete prevention of disease relied not simply on the protection of individual houses but on the sanitary reform of entire communities. Like Chesbrough, Waring recognized the importance of comprehensive sewage systems. In the wake of the 1878 yellow fever epidemics in Memphis, TN, President Rutherford B. Hayes appointed him to a commission directed to establish a plan for the sanitary improvement of that city. Waring developed a plan for a complete sewage system and then, ever the salesman, hired himself out to the city of Memphis to build it. He had obtained the American rights to the ?separate? sewage system of England?s Chadwick and capitalized on his prominence to promote this system throughout the nation. While he reaped the financial rewards of his engineering work, Waring also consulted on sewage projects all over the world and advised the U.S. president on the sanitary condition of the White House. 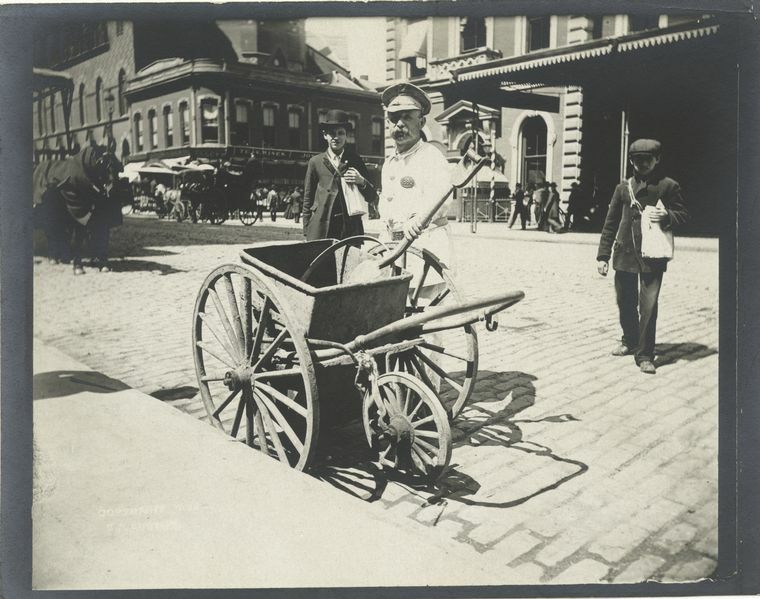 Waring?s tenure as New York City?s Commissioner of Street Cleaning, from 1895 to 1898, was probably his most famous position in the sanitary movement. 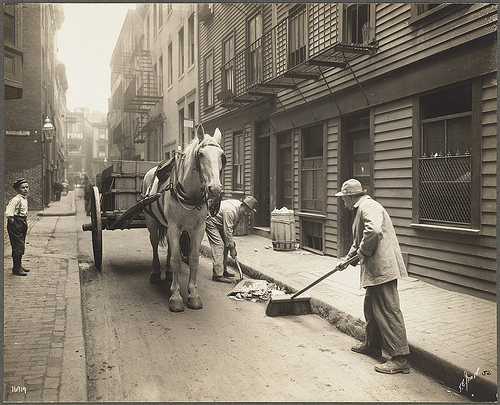 He completely renovated his department?s street-cleaning and garbage-collecting procedures and equipment and transformed New York?s streets from the dirtiest to among the cleanest in the world at the time. Although the return to power of the Tammany Hall political machine cost Waring his job, he would be remembered in the city as the ?apostle of cleanliness?. By the turn of the 20th century, the anticontagionist position had been all but completely undermined by bacteriological research. Waring died of yellow fever in 1898 after visiting Havana, Cuba, to help end the epidemic there. Ironically, this epidemic discredited the partisans of the miasma theory. While the city was completely cleaned and made free of ?sewer gas?, following Waring?s recommendations, yellow fever raged on. The contagionists, led by Major Walter Reed, demonstrated that ?filth? played no causative role in the disease and proved that the disease was transmitted by the Stegomyia mosquito. While the future of public health was in the hands of researchers like Reed, Waring and his anticontagionist forebears had made a significant contribution. The miasma theory of disease may have been inaccurate, but the public health solutions begun to combat ?filth? and ?sewer gas? would have abiding, salutary effects. The anticontagionists built a public health infrastructure and professionalized its management, improving the lives and safeguarding the health of millions. The sanitarians? science was wrong, but their activism in the name of the public good benefited all Americans. Indeed, most medical historians believe that the sanitation movement, and its attendant improvements in urban health and food safety, contributed far more to the increase in Western life expectancy in the 20th century (primarily through the prevention of infectious diseases) than did much of modern medicine. The turnaround in mortality rates came well before the rise and general use of vaccines and antibiotics. Why were towns and cities in the 19th century so unhealthy ? There were many reasons why towns were so unhealthy in the 19th century. These reasons include that houses were built so crowded together in narrow, terraced streets, also there was no law against houses being built properly. The start of the 19th century brought many new changes to Britain. Problems occurred in Ireland and many saw it in their interest to move to more industrialized cities and towns, here they saw new opportunities and leaped to the prospect of a more luxurious lifestyle and this in-turn contributed to the growth in Agriculture and Industry. Despite this being a good thing for Britain it also lead to the growth and over-crowding of many towns and cities. Population figures for Britain's main cities and towns increased at an alarming rate. Due to the huge increase of people flocking to industrial cities, houses had to be built small and were cramped tightly together as near as possible to the large industrial sites. 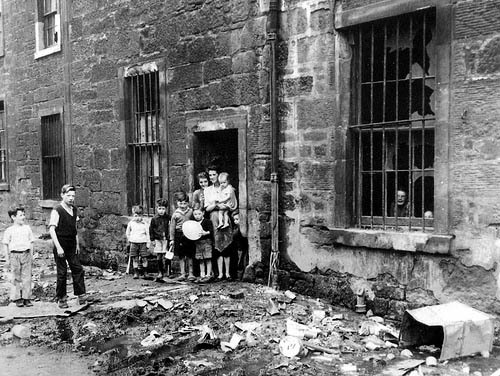 In many, cities such as Liverpool, out of 160,000 only half lived in acceptable houses whilst 55,534 people were crammed in to 1,982 courts containing 10,692 houses. But this poor disgusting lifestyle was not for all, those who were successful and rich, often heads of firms, would live in the suburbs of towns and each of the decent sized houses possessed a small garden. All of these factors resulted in the shockingly young ages of death, as in Liverpool a labourer would only be expected to live to the age of 15, and other cities were hardly any better, like Manchester labourers were only expected to live to the age of 17 and even higher class people only lived a couple of years longer! Disease was spread from person to person, family to family, and house to house extremely quickly. 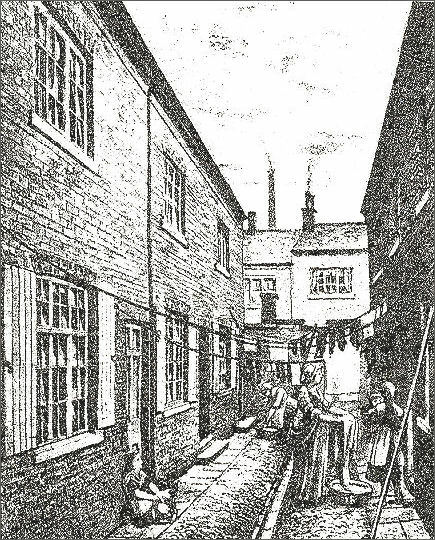 The houses were so cramped in fact that James Smith in 1845 doing a report on sanitary conditions in Leeds wrote this "by far the unhealthiest localities of Leeds are close squares of homes or yards as they are called." A yard is a space in between back to back housing, which is where the privies and in most cases a water pump. He then continued on to say, "The ashes, garbage and filth of all kinds are thrown from doors and windows of the houses upon the surface of the streets." It may be perceived that because the way in which the housing was built in the 19th century it would mean that all people would be able to afford to be housed, but unfortunately this was not the case. Many of the poorer families and workers at this time, in Leeds and many other towns and cities, were unable to earn enough to be able to afford to pay rent for a home. This left the only other alternative to living on the streets being crowding below ground in the cellars of the cramped, dirty and poorly ventilated houses. This was one of the quickest ways in which disease was spread, and so many of these poor people living in disgusting conditions died. In this day and age we take many different things for granted, things we just could not live without. During the 19th century, very few people had access to clean running water, some people queued for water at stand pipes in the street and carried it home in buckets, pans and kettles, others brought clean water from water-sellers, or collected rain water, and others even collected it in buckets from the river. "Clean" water was nowhere near "clean" compared to the standards we are accustom to today, it was not filtered, nor was it full of minerals. 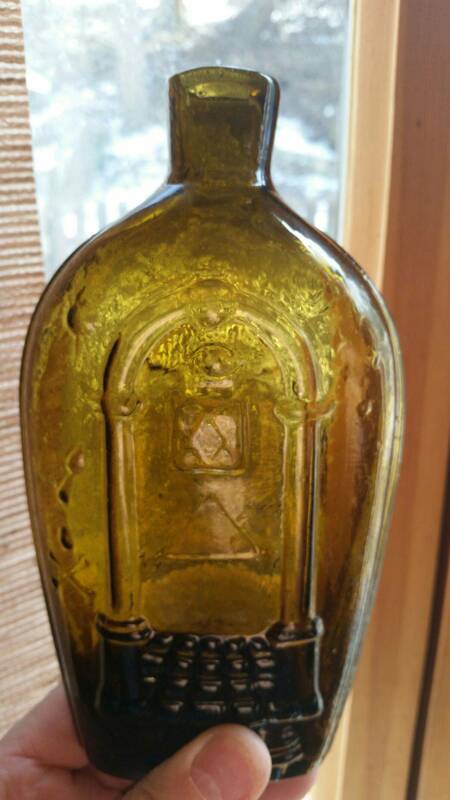 Drinking water was very dangerous; it was full of disease and infections. People chucked their excrement's in the river, people washed in the river, even dead bodies were buried next to rivers, and all the dirt and disease from these things lead to many deaths, and in 1831, 1832, 1848, 1853 and 1866 huge epidemics of cholera, which unknown to Britain's population was spread extremely quickly through dirty water. Water was either running through dirty pipes or came from an unclean source such as the Thames. In a yard there were water pumps, which were very unsanitary, and there were privies. A Privy is the modern day equivalent to a toilet. It consisted of a small hut with no door, a seat with a circular hole in the middle which led down into a cesspit to hold the excrement. One privy could be shared by a whole yard. Excrement was collected by a "night soil-man" who was paid by landlords to remove their tenants waste. 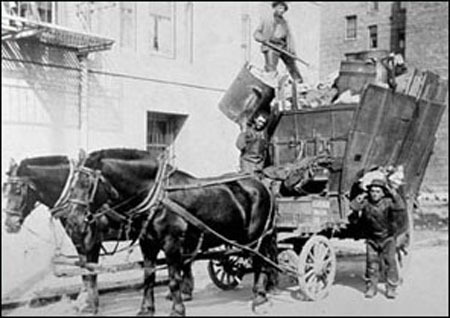 Some landlord didn't want to pay to have this vital job taken care of and so cesspits were allowed to overflow onto the streets, which then caused yet more disease and consequently more people died. The main factor that contributed to all the deaths was disease, in this time cholera was the main form of disease in Leeds. 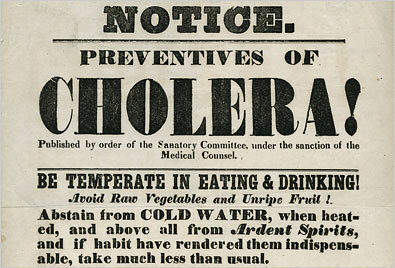 Cholera was spread through contagion in water, grime and waste. 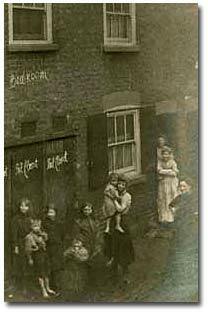 The first recorded person to die on the 26th May 1862 was a two year-old child who lived in Blue Bell Fold, Leeds. The small child began to vomit, got diarrhea, its skin turned a blue black color and its eyes sunk into its face. Its skin went cold. All the parents could do was watch in horror as their baby slowly died. This baby was the first of some thirty thousand people to die from cholera between 1831 and 1832. Other diseases such as tuberculosis, typhoid, typhus, scarlet fever and measles killed tens of thousands of people in the 1830's and 1840's.The doctors of this time didn't have the medical knowledge to know that germs were spread through contagion and not through 'Miasma' (Bad Air) as many medical minds believed. Even when the doctors found out the disease was spread through dirty water the councils were slow to react. To stop an epidemic like this ever happening again we have vaccinations when we are young preventing us from getting many killer diseases, bodies are buried 'six feet under' to stop contagion from happening. The affects of this epidemic were dire and hundreds of lives could have been saved. If only councils accepted that the disease was not spread through miasma but through contagion. If only the builders had spent more time thinking about the welfare of others and not their money. If only the streets had been clean and dry. 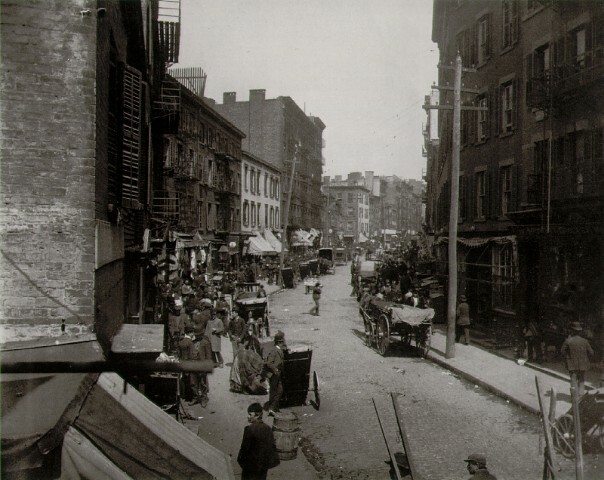 In the first half of the 19th century, many of the more affluent residents of New York?s Lower East Side neighborhood began to move further north, leaving their low-rise masonry row houses behind. At the same time, more and more immigrants began to flow into the city, many of them fleeing famine in Ireland or revolution in Germany. 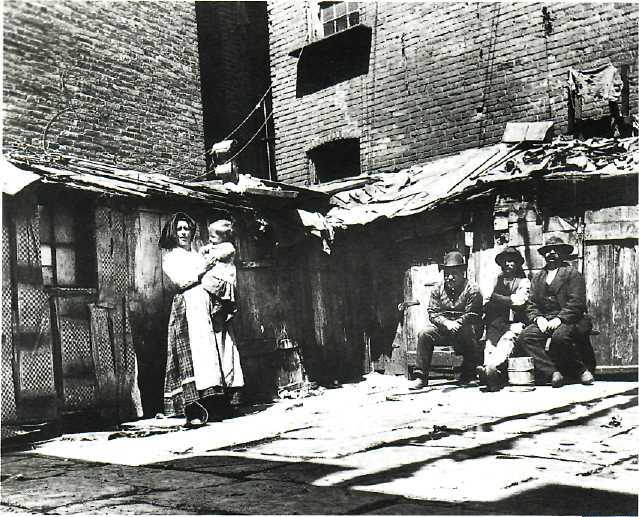 Both of these groups of new arrivals concentrated themselves on the Lower East Side, moving into row houses that had been converted from single-family dwellings into multiple-apartment tenements, or into new tenement housing built specifically for that purpose. 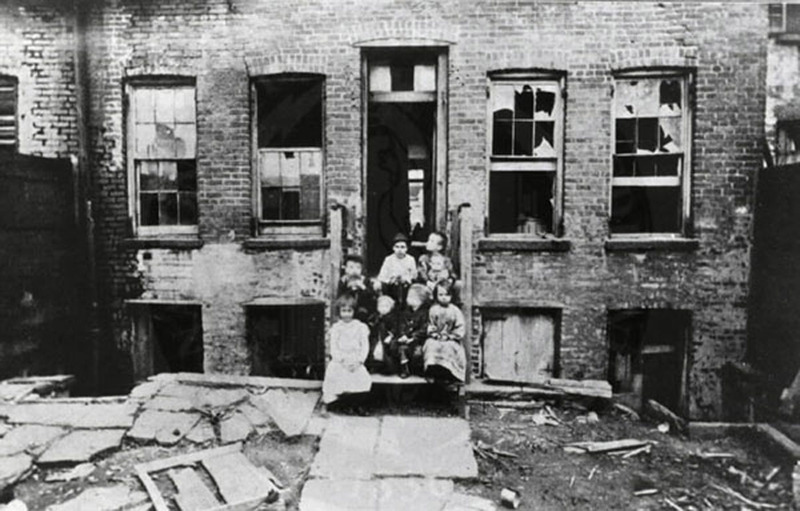 By 1900, more than 80,000 tenements had been built in New York City. They housed a population of 2.3 million people, a full two-thirds of the city's total population of around 3.4 million. 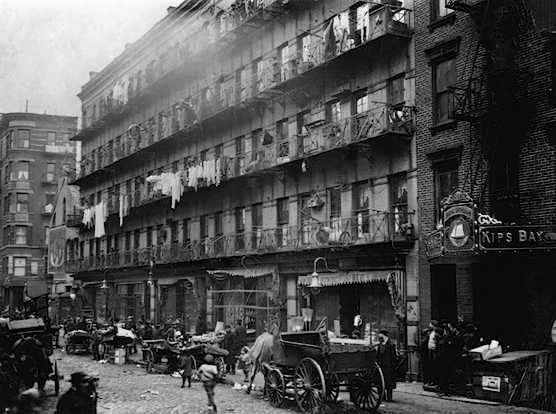 A typical tenement building had five to seven stories and occupied nearly all of the lot upon which it was built (usually 25 feet wide and 100 feet long, according to existing city regulations). 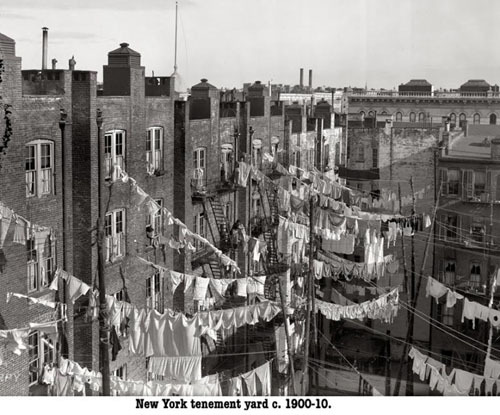 Many tenements began as single-family dwellings, and many older structures were converted into tenements by adding floors on top or by building more space in rear-yard areas. With less than a foot of space between buildings, little air and light could get in. 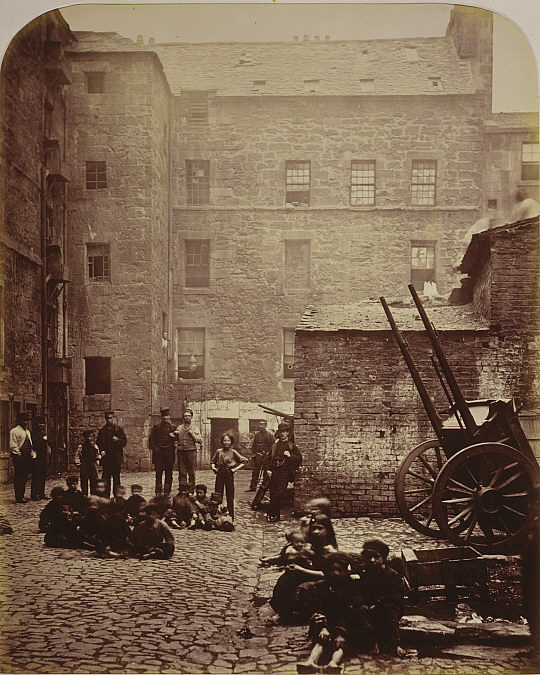 In many tenements, only the rooms on the street got any light, and the interior rooms had no ventilation (unless air shafts were built directly into the room). Later, speculators began building new tenements, often using cheap materials and construction shortcuts. Even new, this kind of housing was at best uncomfortable and at worst highly unsafe. 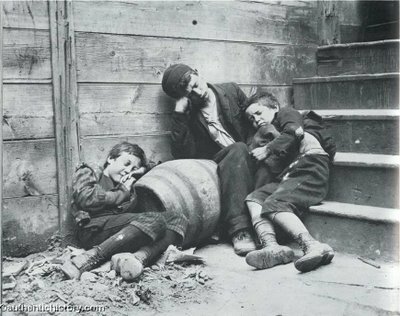 IMAGES OF THE PAST "TENEMENTS & The slums"
Tired from working long hours on the shrimp sorting lot. A garbage loaded street in Boston.